The most popular 2-Day Mt. Fuji Climbing Tour: From June 26th to Sept 9th: Best dates fill up quickly. Private Mt. 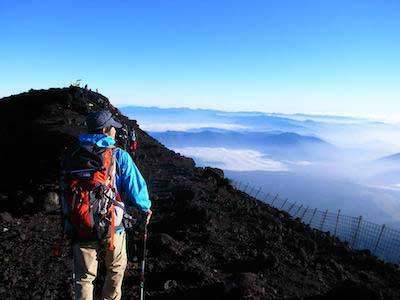 Fuji Hikes for those who want a more Personal Mt. 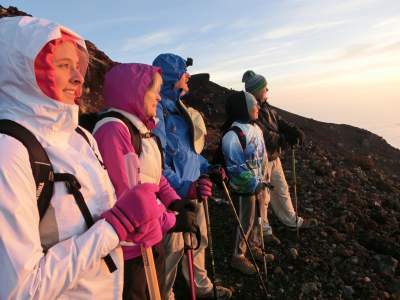 Fuji Hike: Best for VIP or Companies. Off-Season Mt. Fuji Climbs are available just before and just after the official Mt. Fuji Climbing Season. Experience a real traditional Hot Spring (Onsen) while appreciating a picturesque view of Mt. Fuji. Discover Mt. Fuji's Mysterious Aokigahara Forest (Sea of Trees) and Mt. Fuji lava caves. Japan is a country of spectacular natural beauty and each season offers a unique Tour Experience. Handy Travel Packages from Tokyo, Osaka and Kyoto using Japan's high-speed bullet trains. Check 2019 Mt. Fuji Climb Dates Now! Climbing Mt. Fuji is more than just a hiking experience. It is a unique cultural experience with its own set of unspoken customs that can be easily missed or stomped on unknowingly if not careful. Maintaining wholesome relationships with Mt. Fuji locals is key to being accepted into this close-knit society. Make Your 2019 Tour Reservation Now!